If the USC Trojans have any chance of improving this season compared to a disastrous one a year ago, it’ll be about their quarterback committee not messing up, but also about their defense stepping up. One game into the 2013 season, there certainly is room to be optimistic. 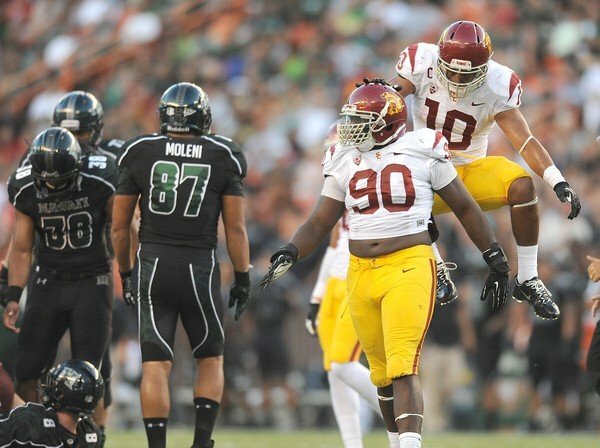 USC traveled to Hawaii, beating the Warriors for a second straight season to open the year with a comfortable 30-13 win, that will probably help them move up from their early 24th ranking on the AP Poll. The key word? Defense. Hawaii quarterback Taylor Graham was intercepted four times, and was sacked seven more, finishing with 16-of-41 for 208 yards, throwing one touchdown pass. Hawaii did manage to keep the rebuilding USC offense at bay early on, even grabbing a 5-3 lead early in the second quarter. But they gave up 18 points based on the interceptions from USC, including Josh Shaw returning one 35 yards for the touchdown. It was hard to pick one exceptional player from the Trojans defense on a game with plenty of players making a case for it, but Dion Bailey was probably it, moving from linebacker to safety (his high school position) and opening the game with a sack before adding a third quarter interception and leading the team in tackles on the day. The bottom line? Hawaii were limited to a single field goal the entire game until the touchdown pass deep into garbage time. 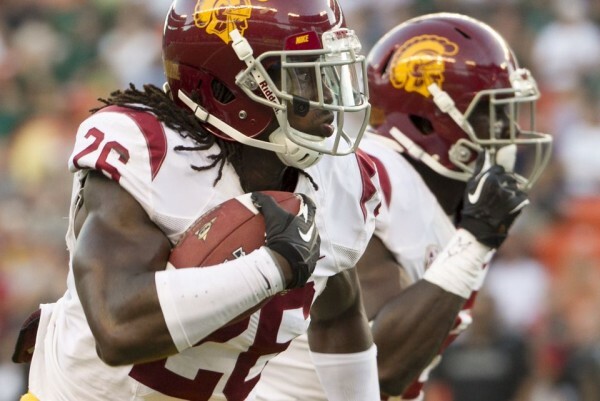 The Trojans have their problems on offense, and the running numbers are slightly misleading. They did finish with 192 yards on 45 carries, including 109 yards on 18 rushes from Tre Madden, but if you take away three long runs of more than 20 yards they gained only 112 yards on the remaining 42 carries. Their third down percentage was appalling, converting only 3-of-14 attempts. Hawaii doesn’t have that good of a defense. We didn’t play very well on offense but we were great on defense. I thought it was a very good effort and I liked the aggressiveness that we showed. Hopefully we can continue to improve on that as the season goes along. Having two inexperienced quarterbacks certainly helps a team look bad on offense, but the offensive line seemed to be the one having most of the problems, allowing the Warriors too much penetration and too much pressure on their key players. Against Pac-12 opponents, it won’t be so easy making up for it thanks to excellent defensive backs. Having a dual quarterback situation is never good. Having Marqise Lee (8 catches for 104 yards) drop three passes is rare to say the least. Nothing going on the field seemed to be helping the Trojans’ offense gain some confidence heading into conference play. I’ve got to make sure that I’m doing what’s in the best interest of the team and I think that showed today. There was not an obvious No. 1 out there today. Neither of them separated themselves, and we didn’t help them very much. We didn’t help them, and obviously that falls on me. The two combined for 15-of-29 for 172 yards, one touchdown and one interception.